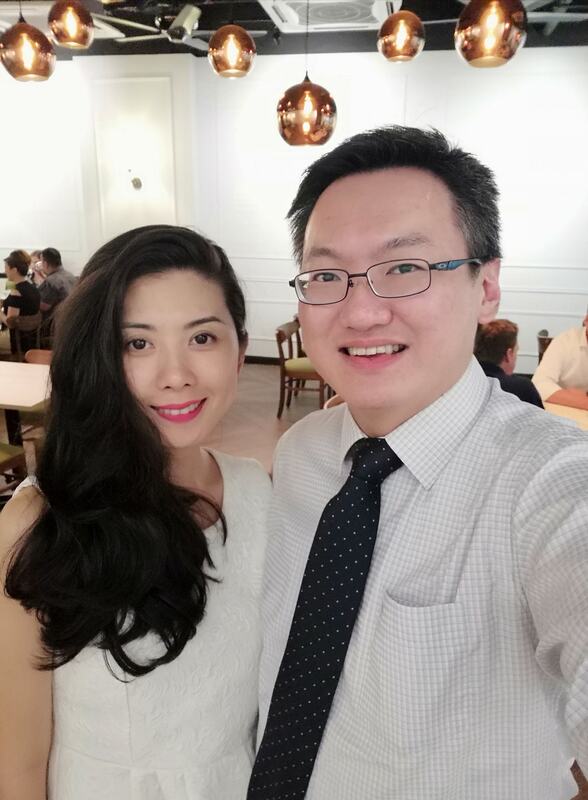 Ruby and I headed over to Champignons in Oasis Square, Ara Damansara, Petaling Jaya, recently to try out their Malaysia International Gastronomy Festival 2018 menu, having tried a couple of their sampling portions at the recent Taste MIGF 2018 at Berjaya Times Square Hotel. 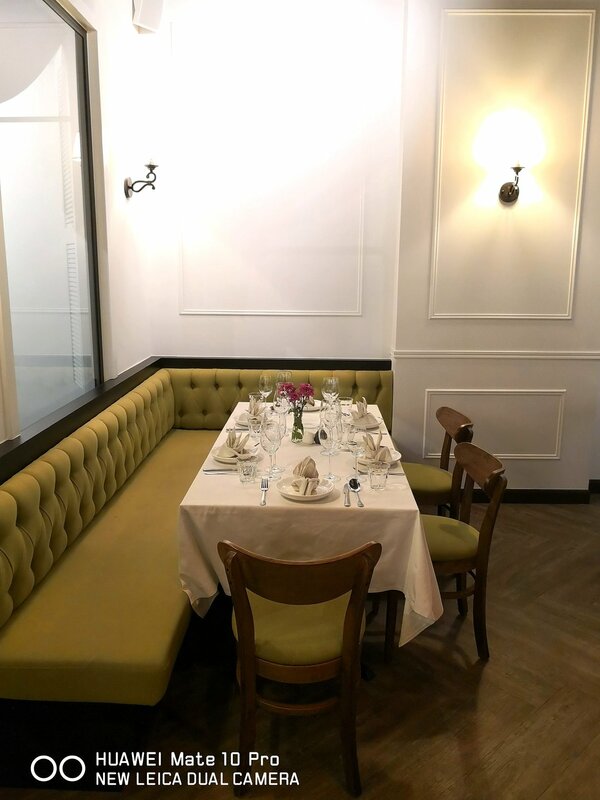 Champignons serves rustic and contemporary European cuisine with a modern touch, and opened at the end of 2017. 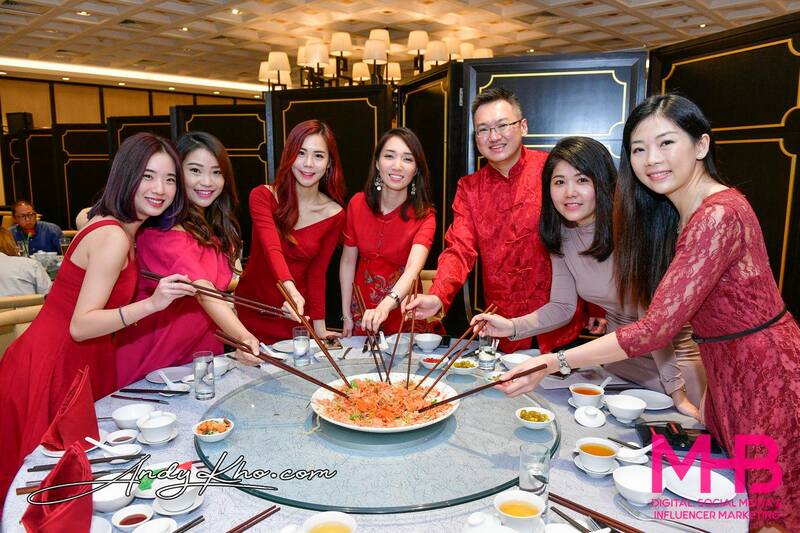 The restaurant is popular among diners as it offers an (slightly more) upscale experience without breaking the bank. 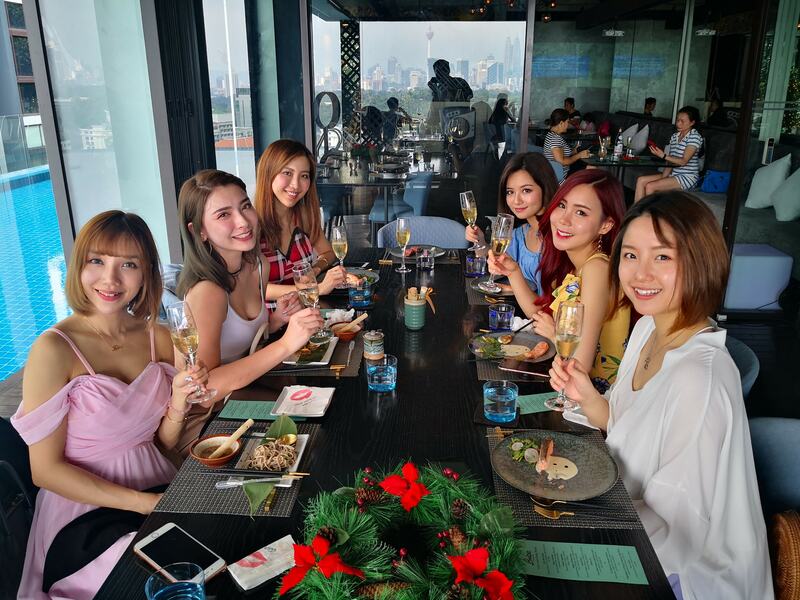 In fact, Ruby and I observed the other diners and there was a good mix of both locals as well as Caucasians (yes in Ara Damansara mind you!) dining there, so you know the restaurant serves quality cuisine. 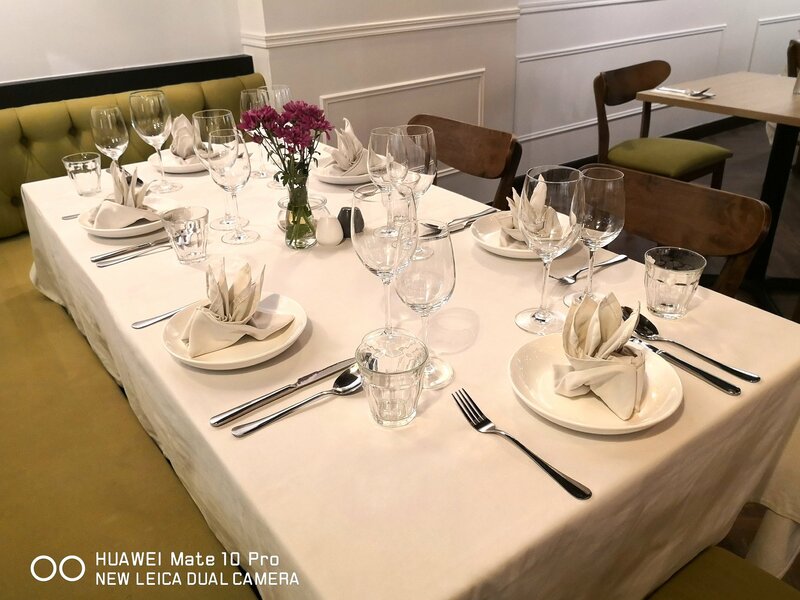 On the tables are fine white linen table cloths, with white cloth napkins, and proper cutlery and wine glasses, matching the white wooden wall panels. An Insta-friendly piece of driftwood with four mushrooms on it (champignons means mushrooms in French) hangs from on one of those walls. 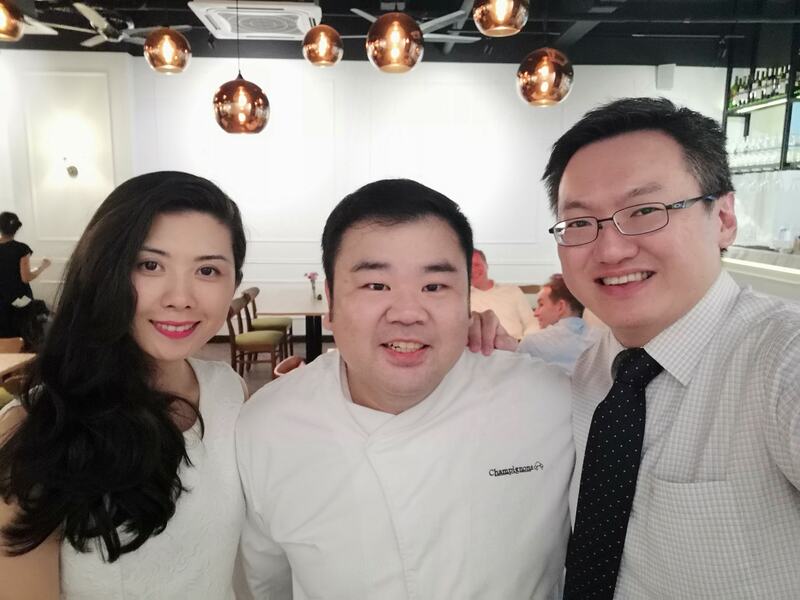 The restaurant is run by Chef Gary Chang, who spent years honing his culinary skills in hotels in Switzerland, London, Dubai and Macao, before finally deciding to return to Malaysia and start his first restaurant together with his partners. Chef Gary believes in pouring his heart and soul into this project, ensuring that the love is felt in the cuisine served to his diners. The restaurant is popular! This was the only unoccupied spot which I could shoot! I fully suggest making a reservation in advance. Alternatively, you can dine outside in the al fresco area which has a handful of tables. Who’d have guessed that you’d find a lovely restaurant like this in Ara Damansara! 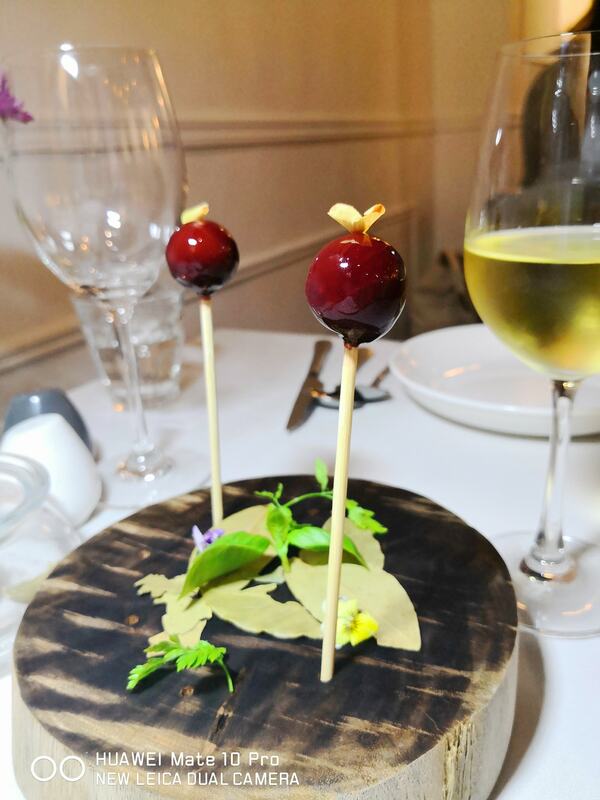 We started off the meal with the amuse bouche which was a cute foie gras lollipop with sour cherry jelly in the core. Now I love foie gras but I do know that it needs to go with something piquant/ sweet to keep it from becoming too cloyingly rich. This little lollipop was the bomb! Lovely earthy flavours of the foie gras with the cherry jelly. What an impressive start! 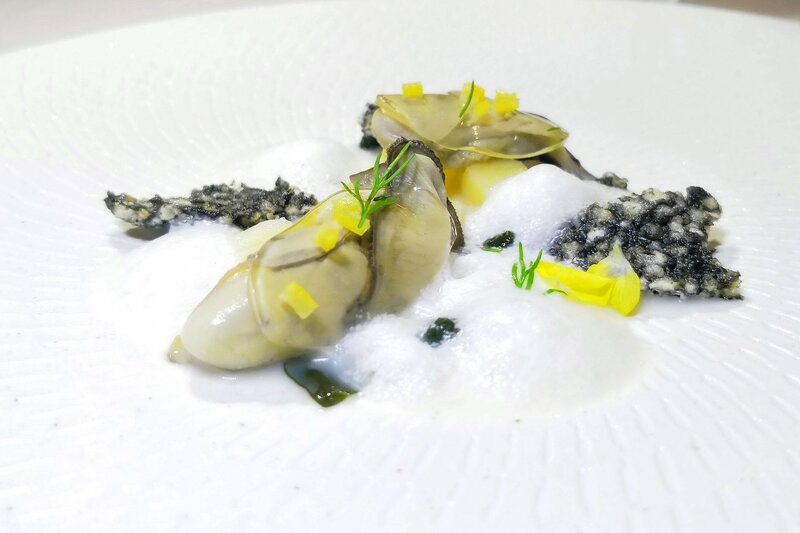 The lightly poached oyster with seaweed crisps providing a contrast in texture, with seawater foam, provided loads of umami flavours. The Riesling which I expected to be really sweet (fortunately it was not!) turned out to be rather dry and matched this starter beautifully! 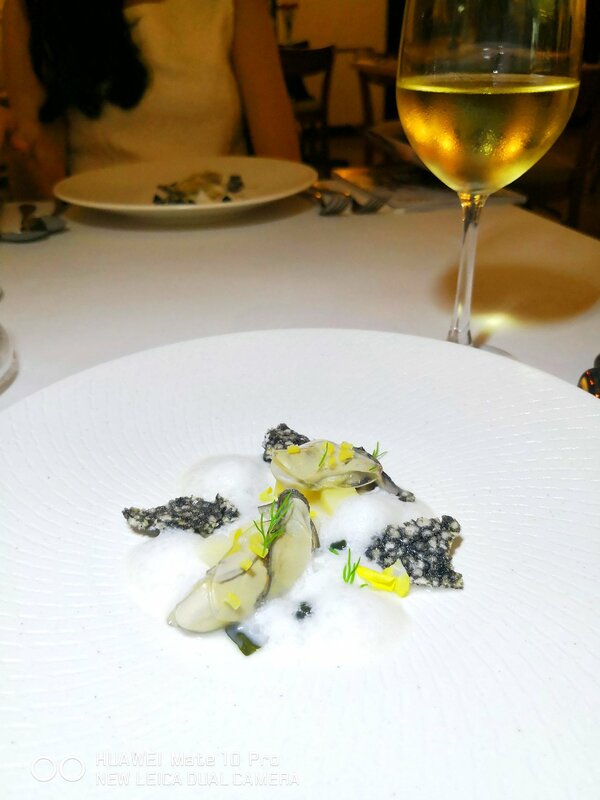 This was the most Insta-friendly dish of the festival menu at Champignons! This was a really hearty soup! 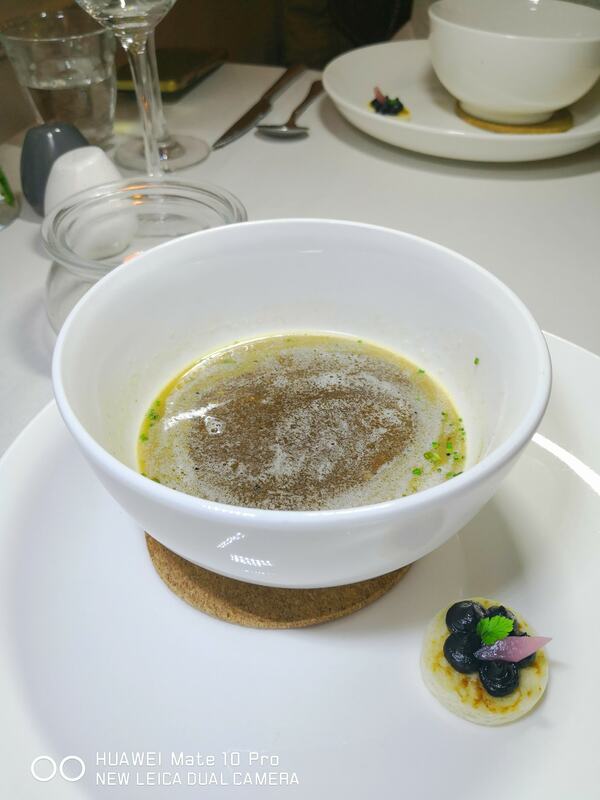 A traditional French onion soup executed perfectly but with a twist in the form of the charcoal onion puree which gave it the dark colour! The sweetness of the broth, balanced out by the savoury flavours of the cheese, made this a soup which I finished to the last drop! 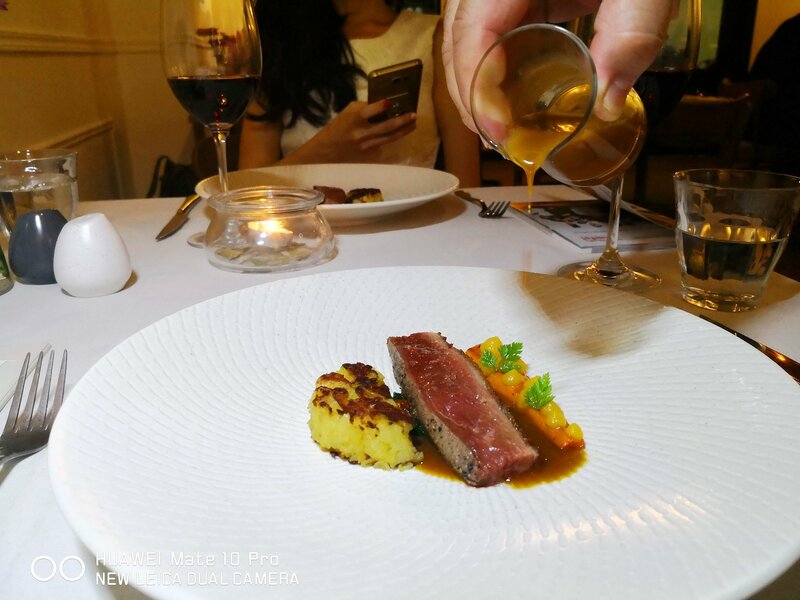 A gorgeous duck breast seared to perfection – retaining its juicy texture and earthy flavours, matched with an orange sauce which was poured tableside by Chef Gary himself. 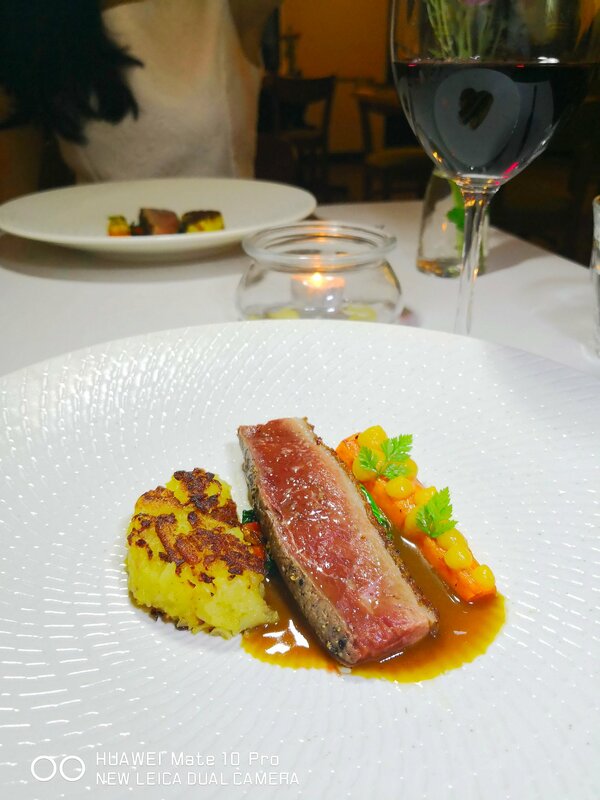 We had a French red wine to go with the duck breast, and it provided an extra dimension of flavours that gave the dish even more depth! 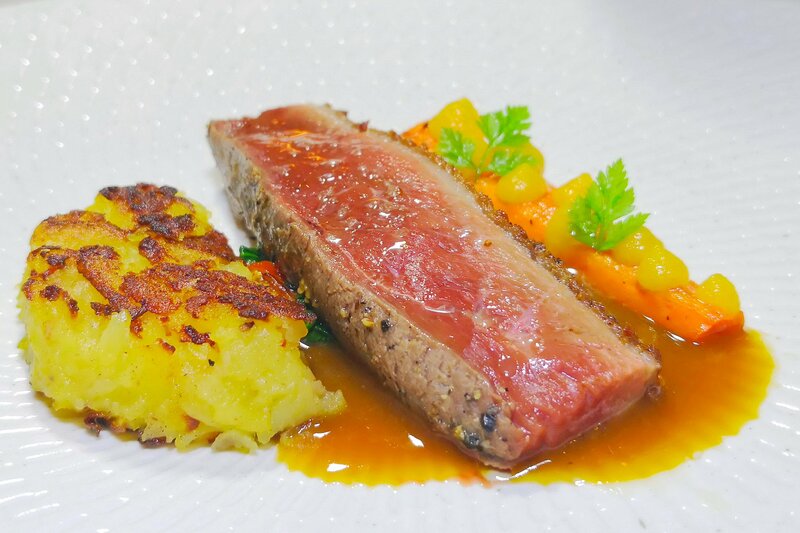 The roasted carrot provided some sweet flavours to keep the palate fresh, while the rosti potato was soft without being mushy. 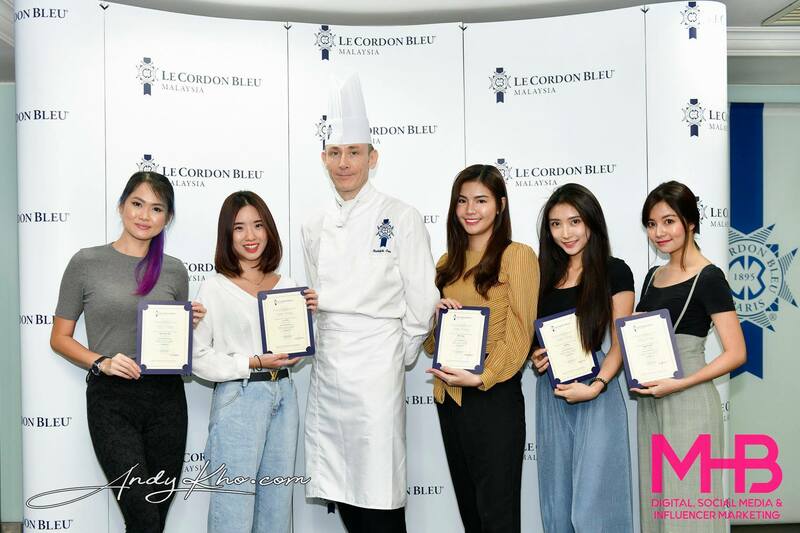 With culinary skills like these, no wonder Chef Gary’s restaurant is a hit with expatriates! Eat this one fast before the mushroom ice cream melts! Yes… a mushroom ice cream which on paper might sound rather weird but it was truly intriguing for someone who likes mushrooms like me. The sweetness came from the caramelised bananas as well as the Isabella Cream Sherry (which has quite a reputation as an English grandmother’s drink but in fact is a very nice digestif, and BTW used sherry casks also utilised to age a number of Scotch whisky distiller like The Macallan as the casks impart the sherry’s rich, sweet and fruity flavours to the whiskies!). The sherry was rich but not too thick or cloying, and had low acidity On the palate, you are hit firstly with caramel, followed by rum & raisins and toffee pudding, and soft wood spice. As it goes down, it becomes drier, with roasted nuts, burnt sugar and walnut husks making themselves known. It has quite a long finish with hints of leather. 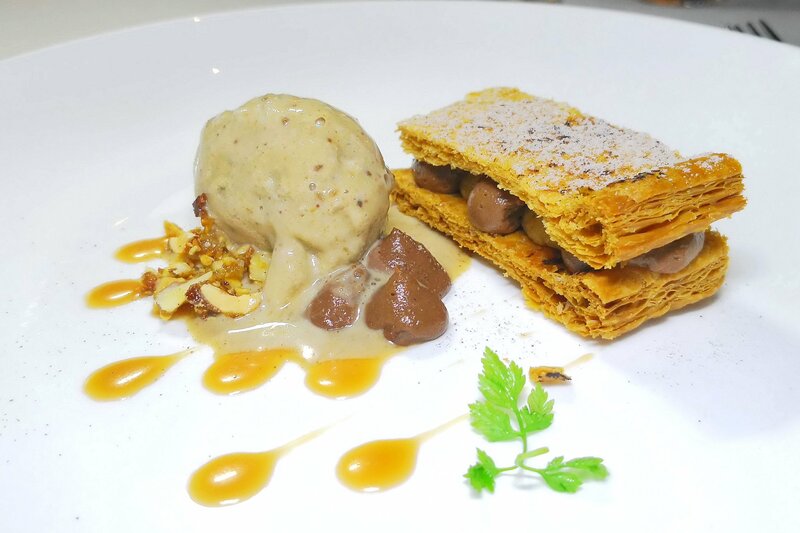 The contrast in texture in this dish came from the puff pastry as well as the chocolate mousse, which all went well with the mushroom ice cream! 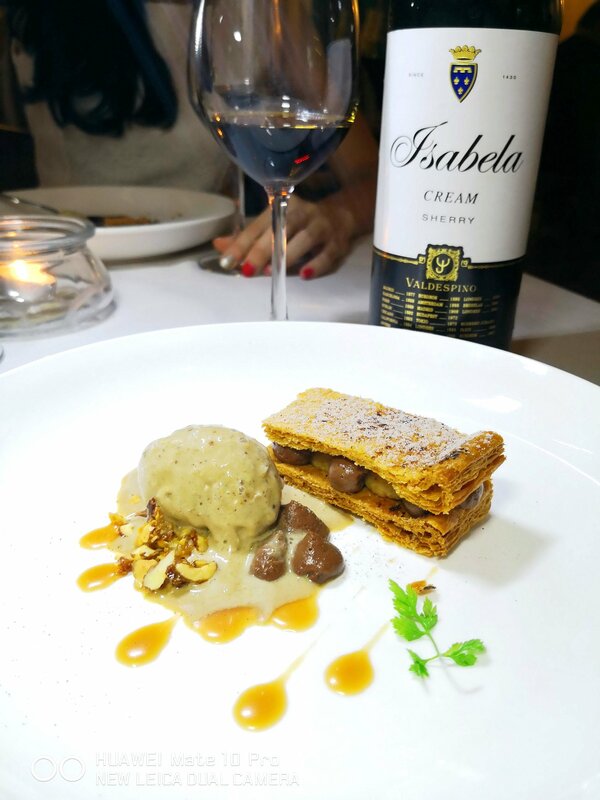 An unexpected but well thought through dessert truly worthy of being part of a MIGF menu! 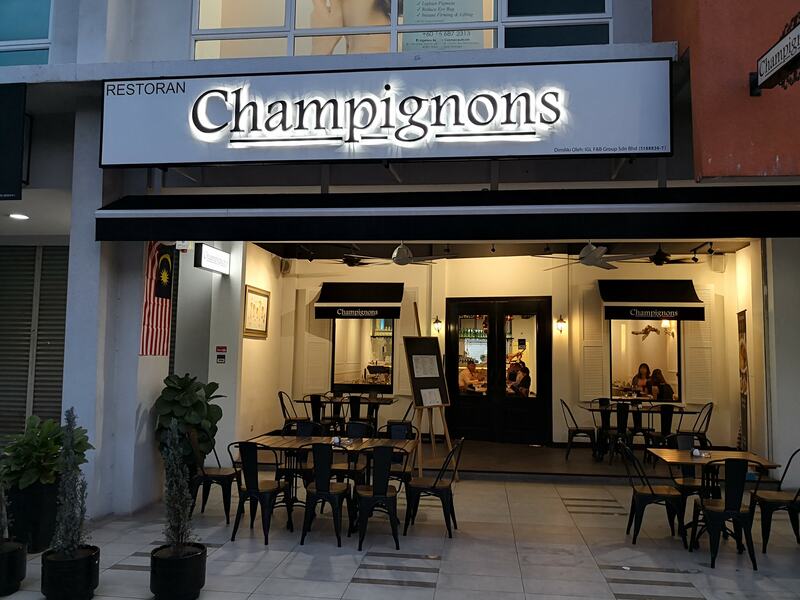 The MIGF 2018 Festival Menu at Champignons is priced at RM188 (without wine) or RM248 (with wine). There are only a handful of nice restaurants (although there are many Chinese coffeeshops, cafes, eateries, and entertainment outlets) around Tropicana/ Kota Damansara/ Ara Damansara so I’m really glad that I found one that’s suitable for a weekend brunch, a weekday set lunch with a client, or even a romantic dinner date with your loved one at prices which are very reasonable! Will definitely be back to try the breakfast menu! All the photos above with the Huawei Mate 10 Pro watermark were shot with my Huawei Mate 10 Pro. The rear cameras of the Huawei Mate 10 Pro are a 20 MP Monochrome + 12 MP RGB, with f/1.6 aperture, OIS (Optical image stablization), BSI CMOS. Dual-LED flash. PDAF + CAF + Laser + Depth auto focus, 2x Hybrid Zoom. I did make minor edits to the photos using the stock apps (that came with the phone) to adjust the lighting, white balance (as the interior had warm yellow lighting) and to crop the photos. However to be entirely honest, I’m a very lazy person when it comes to editing/ post-processing photos, and with the Huawei Mate 10 Pro, its artificial intelligence (AI) function automatically identifies the scene and adjusts the camera settings to best suit it. Incredibly convenient and it saves me a huge amount of time and effort!